(Nanowerk News) A group of researchers from Switzerland has thrown light on the precise mechanisms responsible for the impressive ability of nanoparticles to detect fingermarks left at crime scenes. Publishing their results today, 2 October, in IOP Publishing's journal Nanotechnology ("Nanoparticles for fingermark detection: an insight into the reaction mechanism"), the researchers have provided evidence contesting the commonly accepted theory that nanoparticles are attracted to fingermarks electrostatically. The attraction, they claim, is in fact chemical and is caused by compounds on the surface of nanoparticles bonding with a complex cocktail of compounds present in fingermark residue. The researchers believe a more fundamental understanding of the interactions between nanoparticles and fingermarks will promote the development of more precise targeting methods and increase the chances of detecting previously undetectable fingermarks. 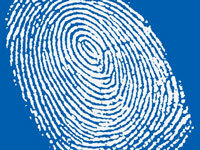 Indeed, it has been estimated that around 50 per cent of the fingermarks left on paper remain undetected. Lead author of the study Sebastien Moret said: "There are number of different techniques used to visualise fingermarks when they are brought into the lab; however, they all lack sensitivity." "Some of these techniques show an affinity not only for fingermarks, but also for the substrate or surface that the mark was left on, leading to background staining that conceals the fingermark." "The majority of these techniques have been developed by a trial and error approach, so it is imperative that we gain a deeper understanding of the fundamental mechanisms that are involved — this paper represents a first step toward this kind of research." Fingermarks are left at crime scenes because of natural secretions such as sweat and fatty compounds, as well as contaminants such as dirt, cosmetics or blood, which accumulate on the fingers. This residue leaves an impression of the characteristic ridges from the finger on a particular surface. In their study, the researchers, from the University of Lausanne, deposited fingermarks onto aluminium foil and then submerged them in an aqueous solution containing silicon dioxide (SiO2) nanoparticles which had been coated with a chemical group, called a carboxyl group, made up of carbon, hydrogen and oxygen atoms. A special dye was also introduced into the nanoparticles so that they could be visualised under certain light once attached to the fingermark. The researchers performed a number of tests in the study to show that the attraction between the nanoparticles and fingermark was occurring because of a chemical bond between the carboxyl group and a specific chemical group, called an amine group, that was present in the amino acids and proteins in the fingermark residue. Up until now, the commonly accepted theory was that an acidic solution in which nanoparticles were placed caused the fingermark residue to become positively charged, which then attracted the negatively charged nanoparticles. Nanoparticles have shown promise in the field of forensic science not only for their small size and optical properties but also for the ability to fine-tune their surface properties, which the researchers believe can be further exploited in light of their new findings. "Now that it has been established that a chemical interaction can be promoted between nanoparticles and a specific chemical group within the fingermark residue, this interaction can be further promoted, leading to more precise targeting, increased selectivity and the reduction of background noise," Moret continued. "Since one chemical group from the fingermark residue has been targeted, others can be targeted as well, thus multiplying the chances of detecting previously undetectable fingermarks."